Could there be a bigger dilemma for a devoutly non-violent spiritual leader than to have his country invaded by a weapon-wielding army under the command of a general who believes that religion is poison? At the age of just 14, His Holiness the 14th Dalai Lama, known affectionately as Kundun, was faced with exactly this situation. In Martin Scorsese’s lavish biopic, Kundun is depicted first as a two year old boy being discovered as the reincarnation of his predecessor then, at aged five, being whisked off to his new home at the magnificent Potala Palace in Lhasa, then at 10, discovering the joys of telescopes, cars and movies. But reality comes crashing in when, at age 14, he has to deal with invasion by the Chinese People’s Liberation Army. As the situation deteriorates, he decides to pay a friendly visit to Chairman Mao (Robert Lin) who tells him that religion, including Tibetan Buddhism, is the opiate of the people and must be stamped out. Back in Tibet, things only get worse as mountain monasteries are destroyed and monks and nuns are forced to fornicate in the streets. In one breathtaking shot the Dalai Lama (Tenzin Thuthob Tsarong) is depicted standing in his red robe among the dead bodies of hundreds of similarly clad monks and lamas. It’s a powerful vision of the blood bath that drenched Tibet in the late ’50s and it provides dramatic contrast to the many other images of the majestic landscape which, due to China’s opposition to the film, were shot in the Atlas Mountains of Morocco and compiled using computer generated imagery. 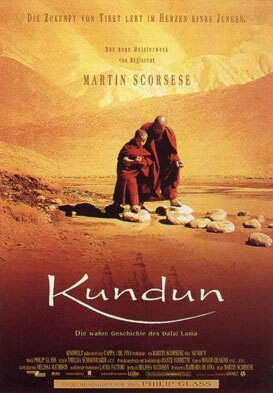 Kundun is a epic meditation of a movie with a mesmeric soundtrack by Philip Glass. It was filmed with the ‘cooperation and contribution’ of the Dalai Lama who now resides in exile in Daramasala, India. In one line of dialogue, the actor playing him says “non-violence takes a long time”. He, and his followers are still waiting.